According to the National Science Foundation report, scientists have developed a powerful new tool in the fight against deficiencies in dietary vitamin A. A deficiency of vitamin A causes eye diseases, including blindness, in 40 million children annually, and increased health risks for about 250 million people, mostly in developing countries. Since corn is an essential part of the diets of hundreds of millions of people around the world, regular consumption by adults and children of adequate quantities of corn high in vitamin A precursors would reduce their chances of developing vitamin A deficiencies and associated health problems. The team is currently working with various international organizations to help train plant breeders in developing countries to use their techniques. 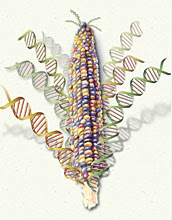 This new method of increasing cultivation of high-vitamin corn was described in the January 18, 2007 edition of Science.